The mouth of the tube is sealed with a barrier to be pierced open by the user at the time of purchase. 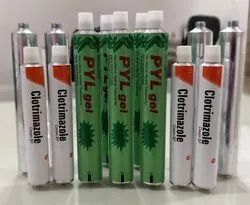 - Hytubes or aluminum collapsible tubes are manufactured to specially suit the pharmaceutical and cosmetic industry. - The feature of Oriental Containers Ltd. is the capability to supply tubes with closed end with internal lacquering and latex. - Sizes available are from 12.7 mm dia to 35 mm dia & in various lengths. We manufacture a wide range of Aluminium Collapsible Tubes that is made from high quality aluminium. Durable in quality, these aluminium collapsible tubes are hygienically made to be used in pharmaceutical industry. We have designed our products in sizes to meet different packaging specifications including critical tolerances for wall, annealing, coatings and seals. - The feature of Oriental Containers Ltd.
We can supply all the required sizes of Aluminium Collapsible Tubes. Our Plant is US-FDA approved. We provide numerous product application options. - Caps: Screw cap, nasal tip, eye tip etc. 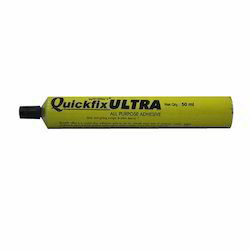 - Options: Seal end, open end, internally wax lined, latex seal, cold seal etc. Available in all diameters and lengths ranging from 10mm to 57mm, with options for different types of nozzles, lacquers and external finishes. Tubes for packing pharmaceutical products, cosmetics, toothpastes, adhesives, paints and other products. We are counted among the reputed manufactures of a wide range of Aluminum Collapsible Printed Tubes that are manufactured in compliance with the set industry norms.